With growing numbers of children with Autism Spectrum Disorder (ASD) being diagnosed in the early years, it is becoming increasingly important for education and health professionals to understand the ASD, and to implement supportive strategies as part of the everyday curriculum and routine. 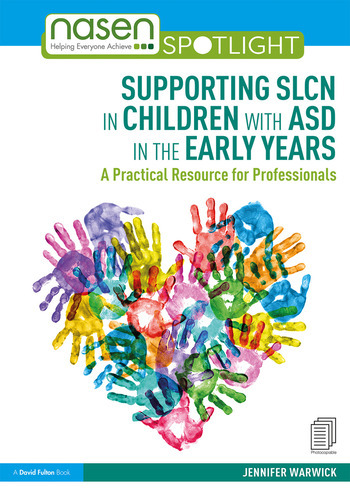 This book serves as an essential toolkit for anyone working with young children with ASD and speech, language and communication needs (SLCN). Filled with practical and up to date tips, advice and guidance, it shifts the responsibility of change from the child onto the caregiver, asking the question, what can we do to support the child? Comprehensive, practical and evidence based, this manual is essential reading for anyone working with children experiencing social communication difficulties and ASD in the early years setting. Jennifer Warwick trained as a Speech and Language Therapist in 2003; she has wide ranging experience with children and young people with ASD and other complex communication needs across both the NHS, charitable sector and in independent practice www.londoncommunicationclinic.com. Jennifer is currently undertaking a part time PhD at City University of London and is committed to research and best practice. She is a joint author of the Early Sociocognitive Battery (ESB) and trains speech therapists to use the assessment tool. Jennifer designs and runs training programmes for parents and professionals to support their knowledge in developing communication skills. In addition to clinical work she has managed and supervised a team of therapists and continues to provide clinical supervision and training to others. She is an advisor for ASD and social communication and Research Champion for the Royal College of Speech and Language Therapists (RCSLT). Jennifer is passionate about improving outcomes in the children and young people she works with.